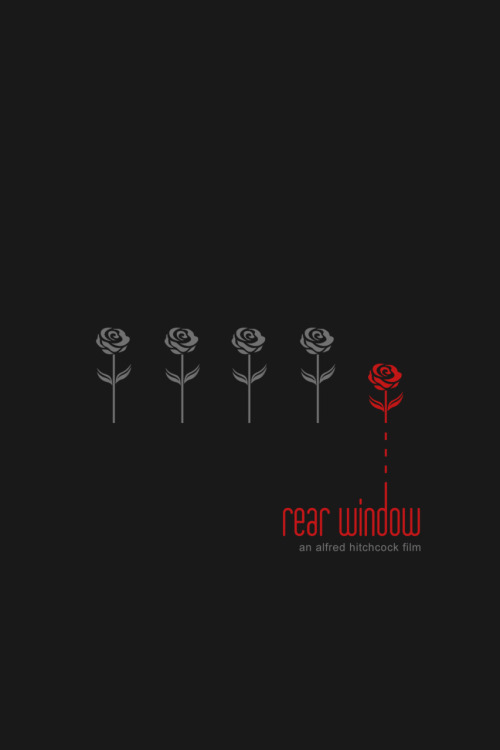 Today, I'm featuring photos, posters, and sketches from director Alfred Hitchcock's classic thriller Rear Window (1954). The photo above shows Hitch conferring with stars James Stewart and Grace Kelly. 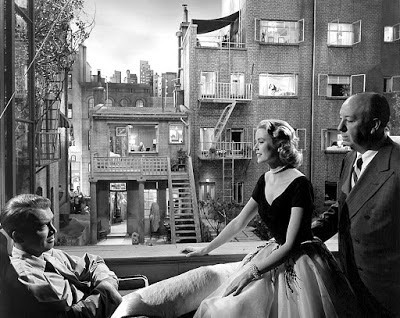 Director Alfred Hitchcock's Rear Window (1954) is a crackling suspense story about a photographer (James Stewart) who, while recuperating from a broken leg, passes the time by watching the neighbors in his courtyard apartment building. However, what starts as an innocent diversion, turns into a high-stakes game of cat and mouse after Jeff and his gorgeous girlfriend (Grace Kelly) witness a murder. 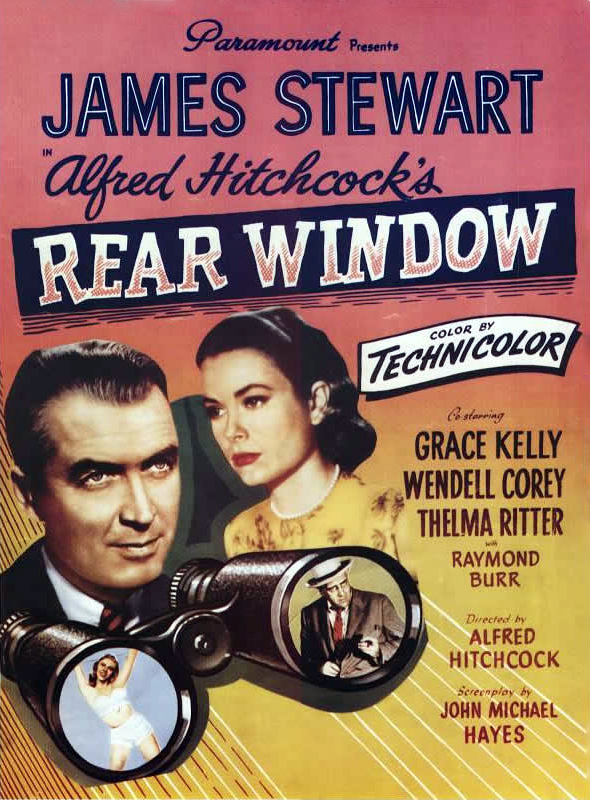 The movie was a big hit in 1954, and it's still a favorite among old Hollywood fans. 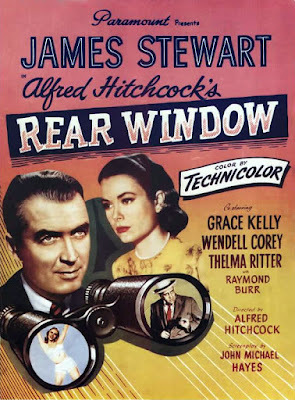 Rear Window will air on June 24 as part of TCM's The Essentials series, and it will also be featured during the network's Hitchock film festival in July. With that in mind here's a gallery of behind-the-scenes photos, sketches, and posters from this stylish thriller. A view of the crew at work on the complicated, multi-level set that was built for Rear Window. 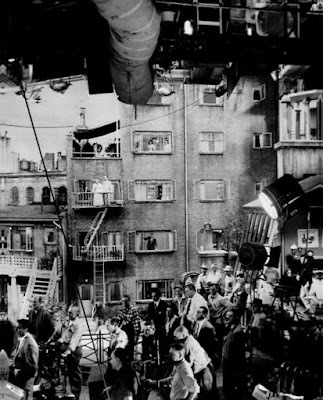 Notice the people in the windows watching the action (photo source: feedly.com). Kelly signs a miniature model of Stewart's cast. Stewart gets a visit from "neighbor" Georgine Darcy, who played Miss Torso in the movie (photo source: doctormacro.com). 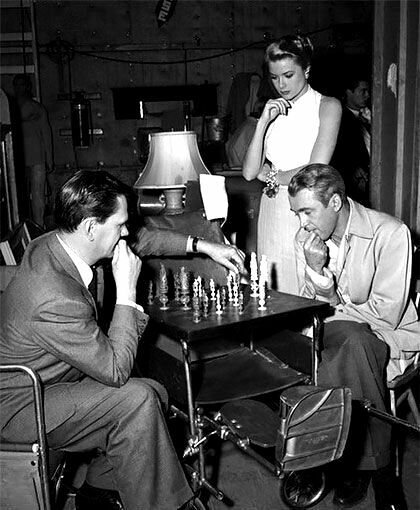 Wendell Corey and Stewart play a game of chess while Kelly looks on. Notice that Corey is sitting in Stewart's wheelchair (photo source: cinematicfanatic.tumblr.com). 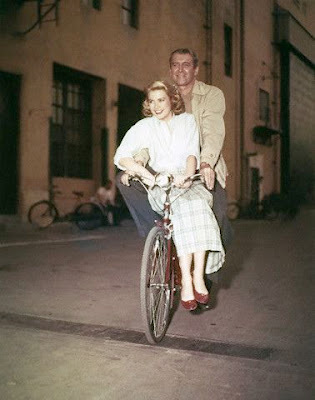 Kelly and Stewart take a bike ride around the Paramount Pictures backlot. Publicity stills are posed pictures that were used to promote old Hollywood films in newspapers and fan magazines; they were also the starting point for poster art. 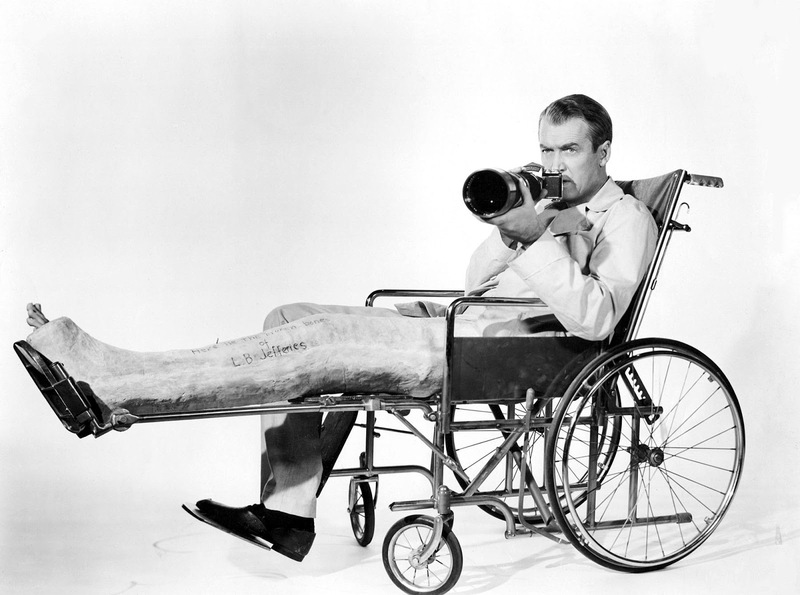 The publicity stills taken for Rear Window showcase the movie's driving plot points i.e, Stewart's broken leg and his camera lens (photo source: doctormacro.com). 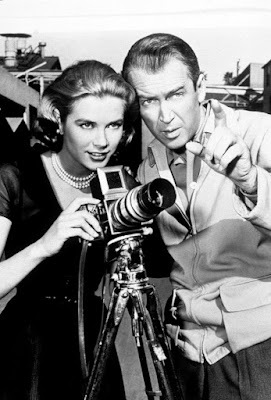 This one emphasizes both the camera and Kelly, who was then one of the most sought after leading ladies in old Hollywood. 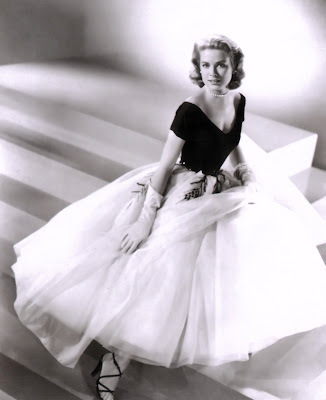 Kelly's patrician beauty made her the perfect model for legendary Paramount costume designer Edith Head. 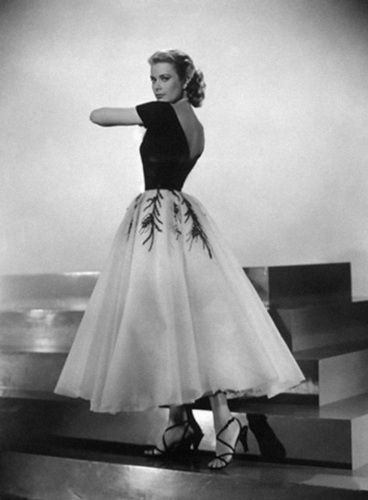 She created several iconic outfits for Kelly in Rear Window. 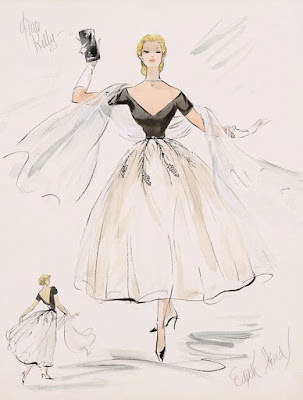 Here's Kelly wearing two of the designs along with Head's sketches. Kelly's character, Lisa, first appears in this fitted black bodice with chiffon tulle skirt. Head's sketch is below. 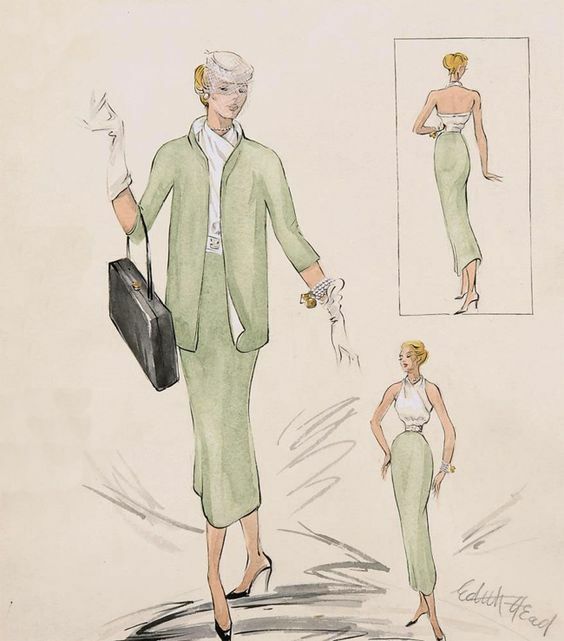 A Head sketch for the Kelly's celadon green suit (photo source: alovelyplace.com). Kelly wearing the suit in her dressing room (photo source: jezebel.com). 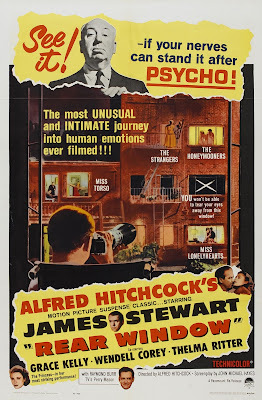 The original release posters for Rear Window (1954) emphasize the movie's main concept -- spying on people through open windows -- but it is done by showing Stewart holding binoculars rather than a camera lens (photo source for all posters: doctormacro.com). A bilingual French and Dutch poster. 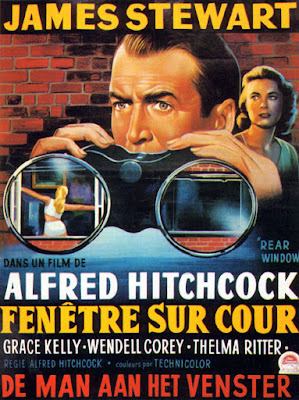 The Dutch title reads "The Man at the Window." The sixties re-release posters showcase Hitchcock, who was by then a household name because of his hit TV show, Alfred Hitchcock Presents. 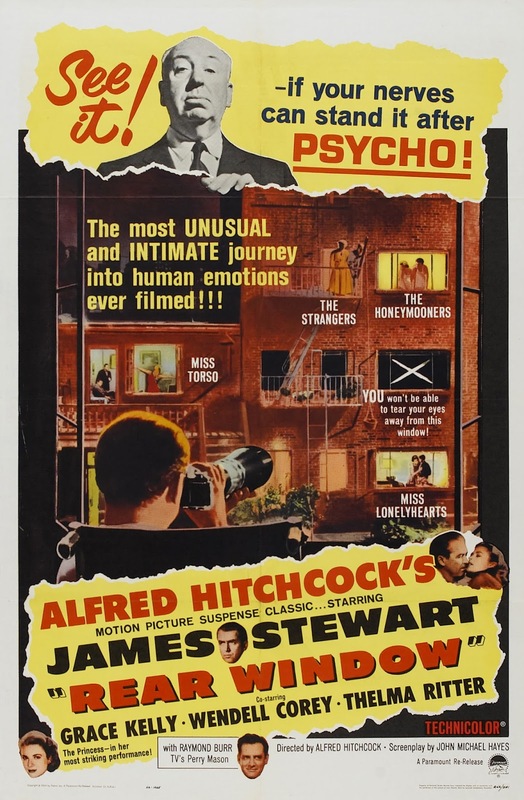 They also feature prominent references to Hitchcock's 1960 blockbuster, Psycho. Rear Window continues to inspire artists in the 21st century. 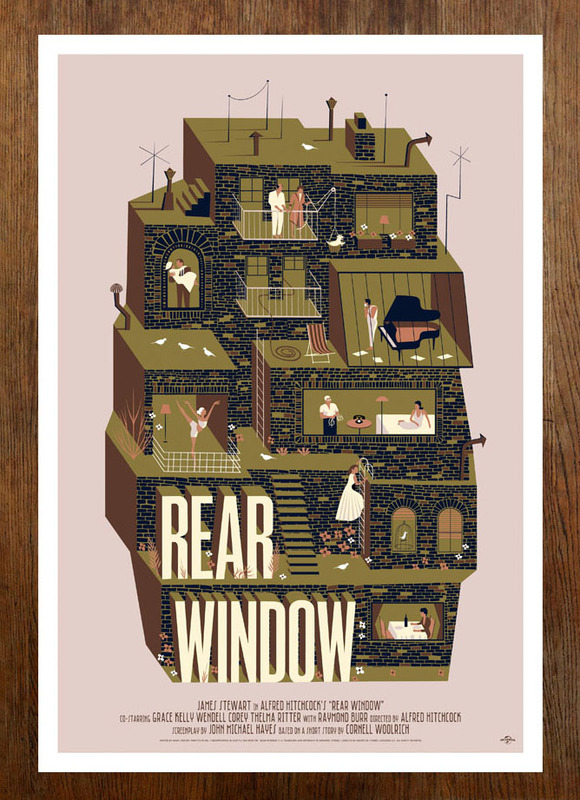 Universal, which now owns the copyright to all of Hitchcock's films, co-commissioned artist Adam Simpson to create a new poster for Rear Window. Visit his website here. My personal favorite is this piece, which was submitted by Andrew Millen to the Tumblr blog Minimal Movie Posters. 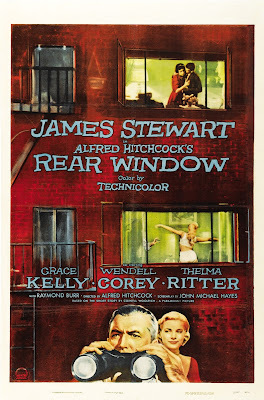 You can look at all their Rear Window posters here. Rear Window will air at 8 p.m. June 24 and 8 p.m. July 21 on TCM. Also available on DVD, Blu-ray, and video on demand. Fun and fascinating trip behind the scenes. 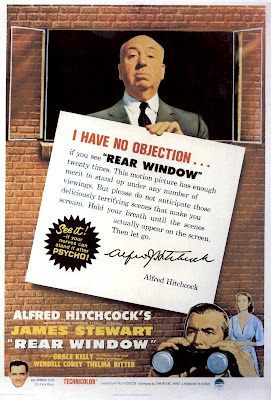 I can't imagine a time when Rear Window will fail to work its magic on an audience.